The Dwarfs of Moria are camped in their Great Hall. 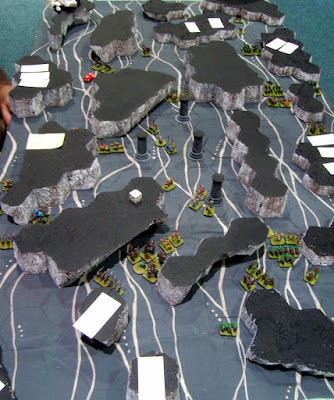 But they soon spring to attention as two groups of Orcs come charging through the labyrinth corridors of the mines. Another quick play game organised by Geordie Paul. Using some rules he downloaded and tweaked a bit and played out in 15mm. Corridor walls are inverted terrain with a coat of matt black paint on the top\bottom to make them blend in. The ground cloth has a subtle hex grid printed over an unsubtle squiggle pattern. 2 players each side, Me and Dave M are the good guys (Orcs), Paul and the Baddies (Dwarfs). 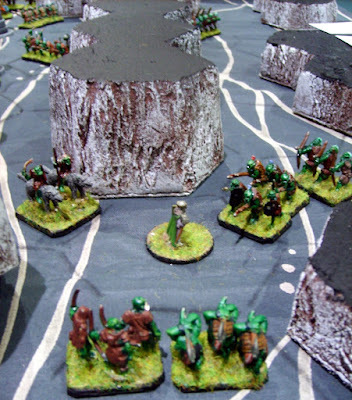 My first wave of Orcs died as quickly as they arrived; there just wasn't enough of them. 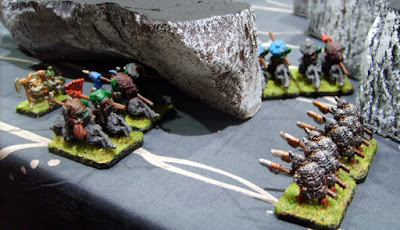 There was about 14 vs 10 Dwarf stands (half of the dwarven force) but the Dwarfs had much better stats, double the chance to hit and double saves and morale. Being closer to the Hall meant that these poor Orcs died off before Dave M's force got fully into contact, I don't think a properly co-ordinated attack would make much difference as the dwarfs were evenly divided anyway. Our distant brothers\cousins suffered the same fate despite some good luck in the reinforcement rolls (but never good enough to bring Billy Balrog into play.). So time to regroup and call for some extra reinforcements. Also for round two a rules tweak - the movement cost to change facing was removed, as it was slowing things down too much when travelling along the twisty corridors. The second wave was a bit more beefed up, 20 bases in my force, of which 4 were second tier troops (wolf riders) and 2 Trolls. Finally had enough forces to start swarming and put pressure on all routes into the Great Hall. Also started to get the hang of the rules, with rotation of forces (individual stands can attack-move or move-attack) and secondary units beefing up the attacks. A combined force of mine and Dave M's little doggies finally managed to punch a hole into the Hall. 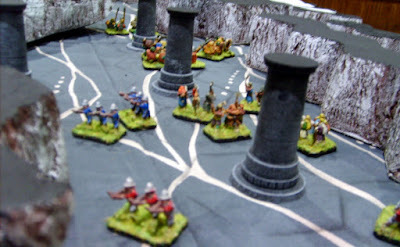 The flanking bonuses that they provided was decisive, they also caused the weakening of the dwarfs defenses elsewhere, as forces were drawn off to deal with the threat. And so the Dwarfs were ground down till their final leader stood alone. Surrounded by Goblinoids, I don't think he's going to get the burial that Balin received in the literature. Time to fire up the Barbie.